1 "Elemental HERO" monster + 1 LIGHT monster. Must be Fusion Summoned and cannot be Special Summoned by other ways. This card gains 300 ATK for each of your bannished "Elemental HERO" monsters. When t..
You can Special summon this card (from your hand) by returning 1 face-up Plant-Type monster you control to the hand, except "Fallen Angel of the Roses". If you do, banish this card when it leaves the ..
A heavenly stallion soaring through the skies on crimson wings..
1 Tuner + 1 or more non-Tuner monsters. When this card is Synchro Summoned: It gains 300 ATK for each face-up monster your opponent controls. Once per turn, during your opponent's Battle Phase: You ca.. If this card targets an opponent's face-up Attack Position monsters for an attack, and that monster is not destroyed by the battle, this card can attack the same monster again in a row. This effect ca.. Cannot be Normal Summoned or Set. Must be Special Summoned (from your hand) by sending 1 face-up LIGHT Dragon-Type and 1 face-up LIGHT Fairy-Type monster you control to the Graveyard, and cannot be Sp.. Cannot be Normal Summoned or Set. Must first be Special Summoned (from your hand) by sending one or more Machine-Type monsters from your hand to the Graveyard. This card gains 800 ATK for each card se..
Must be Special Summoned with "Mask Change", and cannot be Special Summoned by other ways. When this card is Special Summoned: Destroy all Spell & Trap Cards your opponent controls, and all face-up mo..
Must be Special Summoned with "Mask Change", and cannot be Special Summoned by other ways. 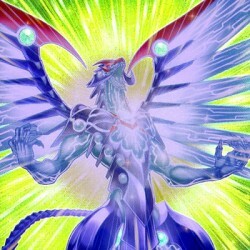 When this card destroys an opponent's monster by battle and sends it to the Graveyard: You can Special Summon..
"Red-Eyes B.Dragon" + "Meteor Dragon"..
3 Level 3 monsters. Once per turn: You can detach 1 Xyz Material from this card to target 1 Level 4 or lower face-up Attack Position monster your opponent controls; gain control of it until the End Ph..
Special Summon 2 "Photon Tokens" (Thunder-Type/LIGHT/Level 4/ATK 2000/DEF 0) in Defense Position. These Tokens cannot attack or be used as Synchro Material Monsters. You cannot Summon other monsters t.. Cannot be Normal Summoned or Set. Must first be Special Summoned (from your hand) by banishing 2 Level 7 or higher Plant-Type monsters (one from your hand and one from your Graveyard). Once per turn, ..
1 Tuner + 1 or more non-Tuner monsters. Your opponent cannot target face-up Warrior-Type monsters for attacks, except this one. Once per turn, this card would be destroyed by battle, it is not destroy..
1 DARK Tuner + 1 or more non-Tuner monsters. Once per turn, during either player's turn, when your opponent activates a Spell/Trap Card while yopu have no cards in your hand: You can negate the activa..